This stylish book author WordPress theme comes with built-in “Easy Install”. Once you activate the theme, click this button and it will magically turn your site look exactly like the theme’s demo on our site. The sample data will configure all necessary settings and add the sample content on your site. This means your digital products store can be ready in no time. 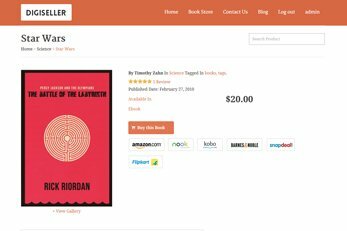 What can you sell with this book author WordPress theme? We have designed the Book Author theme to be as flexible and customizable as possible. The sky is literally the limit when it comes to what you can sell with this theme. Being able to create unlimited product categories and sub-categories, you can sell any digital products with WordPress. The Book Author theme can be for example used to sell, eBooks, stock photography, audio files, videos, DVDs. The Book Author theme is also ideal for promoting and selling any digital download products such as digital art, icons, clip art, music or even templates or themes. This responsive online store theme for digital goods can also be ideal for selling, media files, computer games or courses. 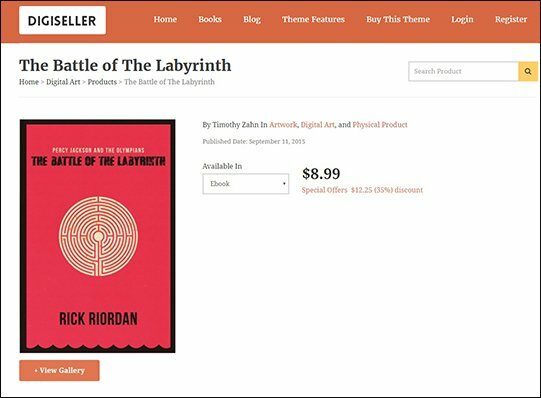 The Book Author theme has been designed to cut the number of steps needed to checkout. Faster and easy digital downloads for your customers helps you to sell more products. 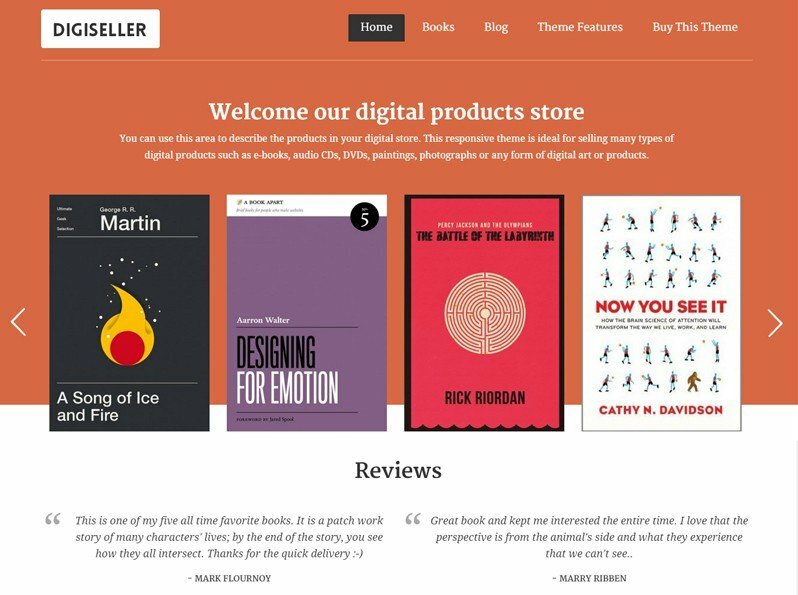 The Book Author theme is responsive and built to look great on any device. This stylish digital downloads WordPress theme should not let you miss any sales. No matter which device your customers visit your site from, your store should look just as great. 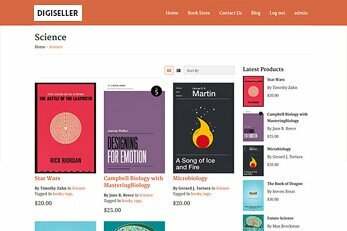 Book Author have modern homepage with a beautiful slider, this slider can also be used to show products category wise. The theme is having built it catalog mode feature which is very useful for those who just want to showcase their digital products and don’t want the buy button. 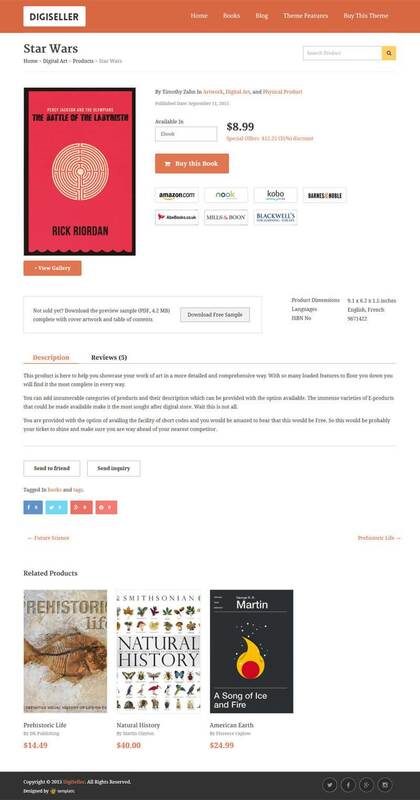 Book Author theme comes with our very own Digital Downloads plugin which lets you sell digital goods straight off your site. It’s a plugin that will enable swift and easy product-selling features on your site. You can customize this theme to match any products you wish to sell online. This stylish and powerful WP theme for online stores can easily have its color scheme and product categories changed. This is done straight from the admin dashboard, no coding. Need to increase your sales? This easy to configure and manage theme is the best solution for creating your online digital products store with WordPress at an affordable price. Create unlimited product categories and sub-categories. Sell any type of digital products you can think of. PayPal included with more optional gateways available. Customize your store with widgets and color customizer. Be in full control of your profits. We don’t take any percentage. Display Google AdSense or other banners around your site. Add your own logo and remove the footer credit for free. Sell as many products as you like, there is no limit. This theme is coded per best of the SEO practices. Not only that, this theme also supports the best, free SEO plugins available today such as Yoast SEO, All In One SEO and Google XML Sitemaps, so you can be sure you don’t miss any traffic. As well as compatibility with above plugins, this WordPress digital downloads theme generates friendly URLs. Translatable and Multi-lingual online store! This theme has been tested with popular WPML plugin and .PO and .MO files are provided with this theme. Using WPML plugin on your site lets you offer your customers a multi lingual store. You can alsotranslte this theme into another language instead of English. The WPML plugin is not required for this, you can translate it using the provided .PO and .MO files. Built to give you a stylish, customizable and powerful digital products store and increased sales figures. Import or export products with an easy to use tool which works in .CSV format. Use the included Digital Downloads plugin or use the eJunkie cart or link to Amazon. We don’t take any percentage on sales. Whatever profit you make is all yours. Your customers can quickly search for products on your site. Display your store location on a Google map if you like. Add an unlimited number of products to your store. No limits. Control your digital goods store from your admin dashboard and be in full control. 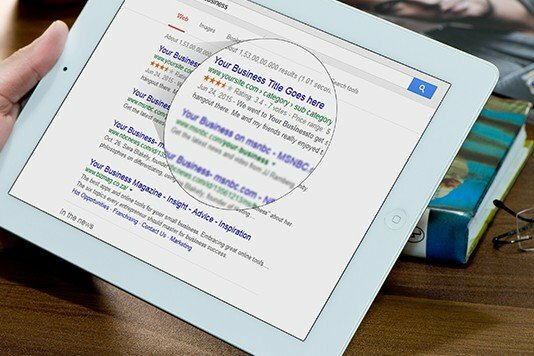 Your customers can add reviews on products. You can disable this option too. Various email notifications are sent at different events with easily manageable content. 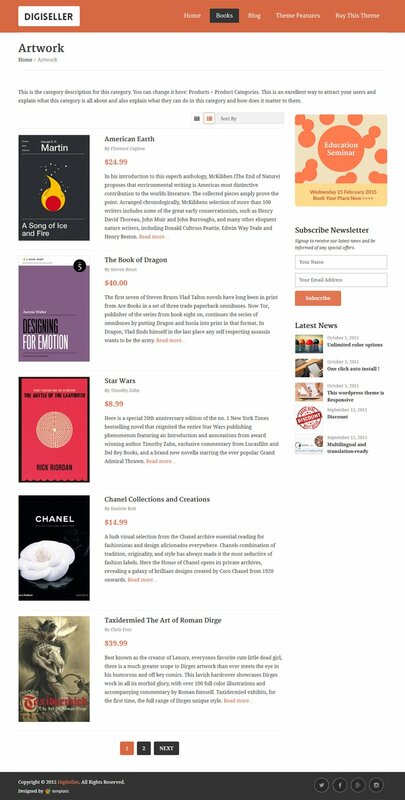 PayPal comes included with the theme, so you can start selling your ebooks right away. Additionally, this ebook seller’s theme also allows integration of some of the industry’s best payment gateway modules in your ebook website. This gives you more option to choose the payment processor and integrate a flawless payment method for your online digital store. How long can I use the Book Author theme? Are there any monthly/yearly renewal fees? Forever. Once purchased, you can use the Book Author WordPress theme for as long as possible. However, the support and updates are limited to one year. 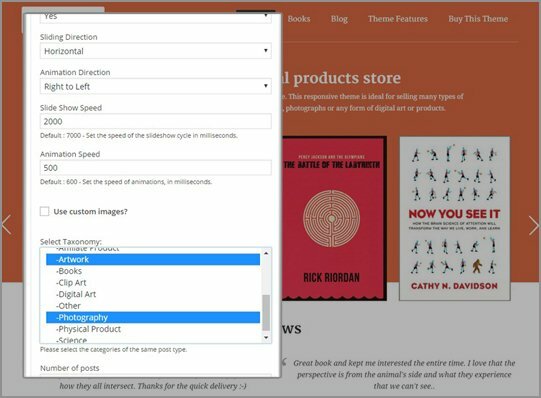 After one year of purchase, you can still use the Book Author WordPress theme without updates and support, for as long as you want. Do I have to pay extra for the Digital Downloads plugins? No, the Digital Download plugin comes included with the Book Author WordPress theme. You don’t have to purchase it separately. Can I use the book author theme to sell digital products other than ebooks? Absolutely yes, the digital download plugin can be used to sell any kind of digital product. 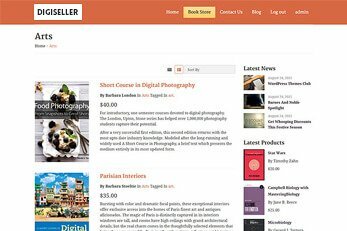 You can use this digital selling WordPress theme to sell an ebook, MP3, audio, video and other digital products online. 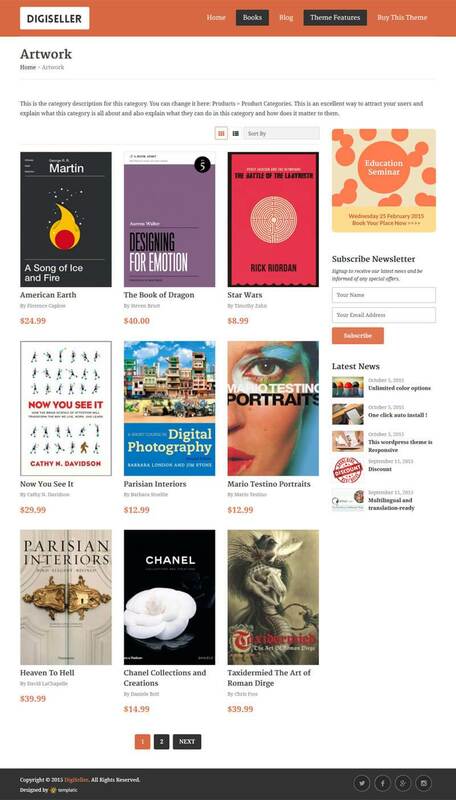 Are there any other ways to sell my ebooks/books? 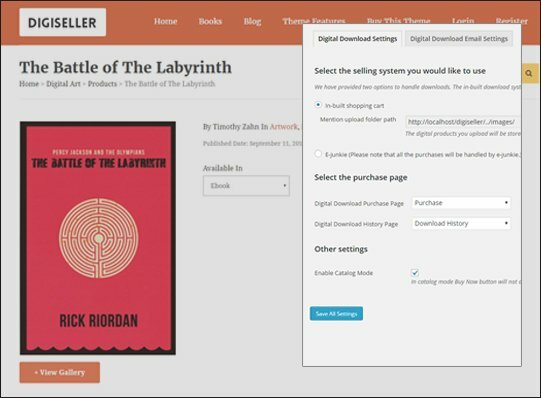 Yes, besides the digital downloads plugin, there are other ways through which you can sell your ebooks on your website. You can opt for sales through eJunkie or provide a link to you amazon sales page. Can I blog using the Book Author WordPress theme? Is there any commision of hidden cost to be payed? No, you keep all the profit to yourself. 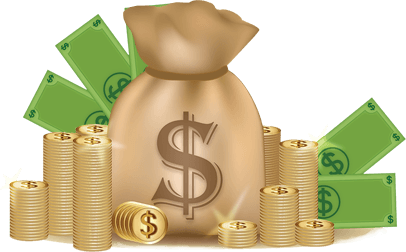 All you earn through your digital selling WordPress website is yours. No need to purchase additional plugins, and absolutely no hidden charges. 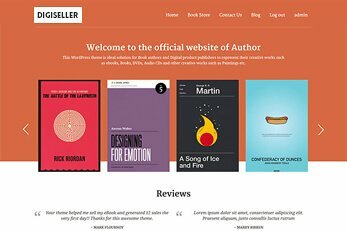 How can I create a book review website with the Book Author WordPress theme? The Book author WordPress template is very flexible and highly customizable. You can use it to create any kind of WordPress website. The Book Author WordPress can be used to create a book review website too. 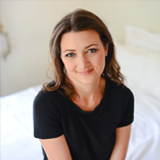 What is the maximum number of books/products I can sell through Book Author theme? There is no limit on the number of books or digital products you can sell through your digital selling website. 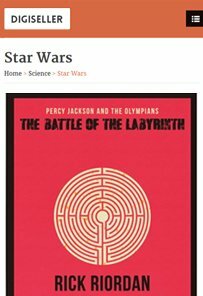 Can I use Book Author theme to sell access to digital products based on subscriptions? No, you can only sell eBooks through your WordPress book author theme. With this WP Author theme, you cannot sell digital products on a subscription basis like a software downloading site. Now you can create a digital product selling website on your own. Selling digital downloadable products was never easier. With this feature packed eBook WordPress theme, it takes just minutes to start your eBook store with this. Install the theme with just one click, customize it as much as you need, add your products and start selling downloadable products just in minutes. 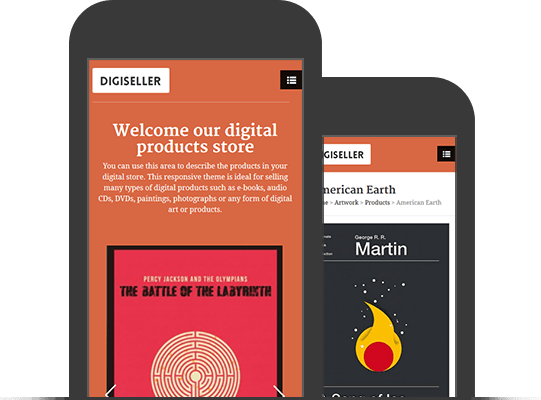 Even though this Digital eCommerce theme is designed to sell ebooks online, you can sell any type of digital or downloadable products easily. Create your WordPress website with digital delivery tools and no monthly fees or commissions on the sale of your digital products. Sell creative products such as eBooks, whitepapers, photography and digital downloads. 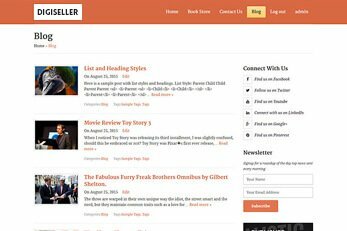 The Book Author theme is easy to use and flexible. 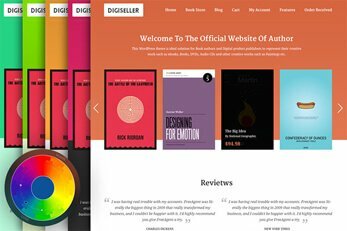 So get this ebook selling WordPress theme at just a fraction of the price and start selling your digital products online today. Hundreds of hours of team effort went into design and development of this Book Author theme. Get hold of this theme at a fraction of the price which it actually cost to develop and start your business website today and create book website easily.